If the report of the Human Rights Watch (HRW) in 2009 were to be believed, it was in mid '90s when the killings of the vigilante groups started. The killings were claimed by the Suluguon sa Katawhan which basically translates to "Servant of the People" in English. That name morphed into a more vile and easier to remember name soon after, thus the birth of the Davao Death Squad or simply DDS. Despite of the number of deaths attributed to the shadowy group, no member of the group was ever caught or prosecuted in the last 2 decades. Former CHR chair Etta Rosales also admitted that since they started their probe in 2009 up to this day, the CHR didn't find any evidence that would point Duterte as the headmaster of the DDS. 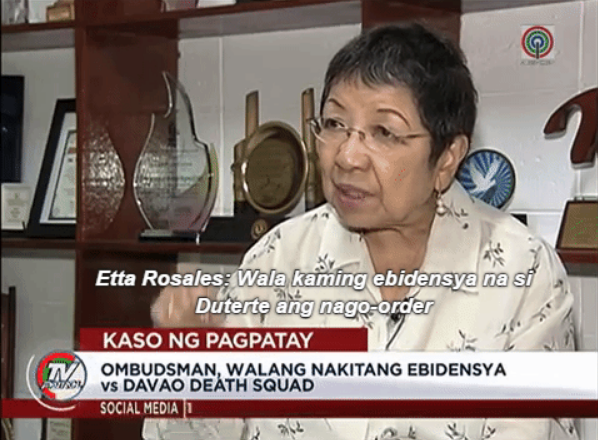 The government, spearheaded by the Ombudsman merely dismissed police officers for what it describes as their failure to stop the killings in their respective area of responsibility. In June 2012, Commission on Human Rights recommended to the Ombudsman that it should investigate then Davao City Mayor Rody Duterte. 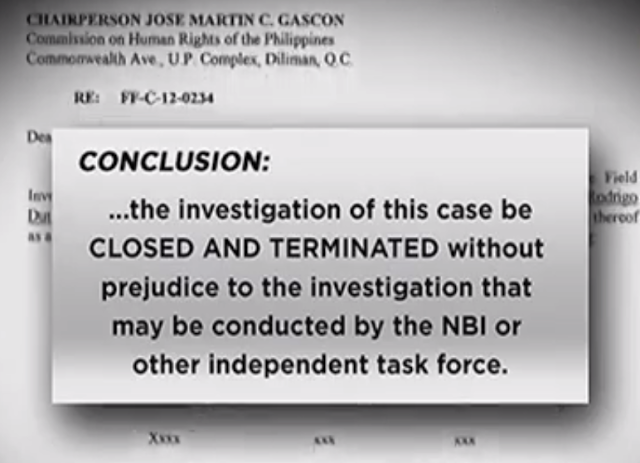 But in a letter in January 2016, the Ombudsman penned the CHR telling them that the investigation on the case is CLOSED and TERMINDATED. Despite of the judgment from the Ombudsman, CHR and De Lima are now trying to seek for the intervention of international groups to the alleged killings. Screengrabs from Abs-Cbn News report.